I am sur e many of you even haven't heard of the brand NEO. Well, they make cheap electronics, including kitchen appliances, heaters, and all other kinds of consumer goods. NEO is very popular in Eastern Europe where many hotels are using NEO's goods for their rooms' electronics. Very cheap - their TVs are really cheap and if you get one on sale, they become just a great deal. 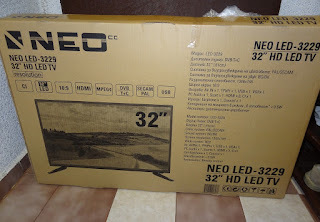 Relatively reliable - from what I've seen and heard so far NEO televisions are relatively reliable with average build quality and usually without any issues during the warranty period. Follow the latest trends - no matter we are talking about cheap products NEO are always trying to catch up with the bigger brands and follow innovation trends on the television market. Now I would like to talk a bit more about the NEO LED-3229 which I tested couple of months ago. This 32-inch TV proved to be very good for the price of 120 Euros. I liked its design and picture quality but not so much the sound which was really poor. In comparison the Luxor televisions we've tested last year had similar picture quality but slightly different price tag. Other brands competing with the NEO TVs would be UTOK, Hisense and few others. Of course I haven't forgotten about Blaupunkt, another of my favorite cheap brands - they offer small televisions as well as big screen TVs. That is my quick opinion about the NEO LED televisions I have seen and tested. If you have some experience with any of their TV sets please share it in the comments below.